We were stood on the corner of Waller and Stanyan, alongside the McDonald’s parking lot and opposite the historic Stanyan Park Hotel. It was 10.20 on a sunny if cool Saturday morning in April. 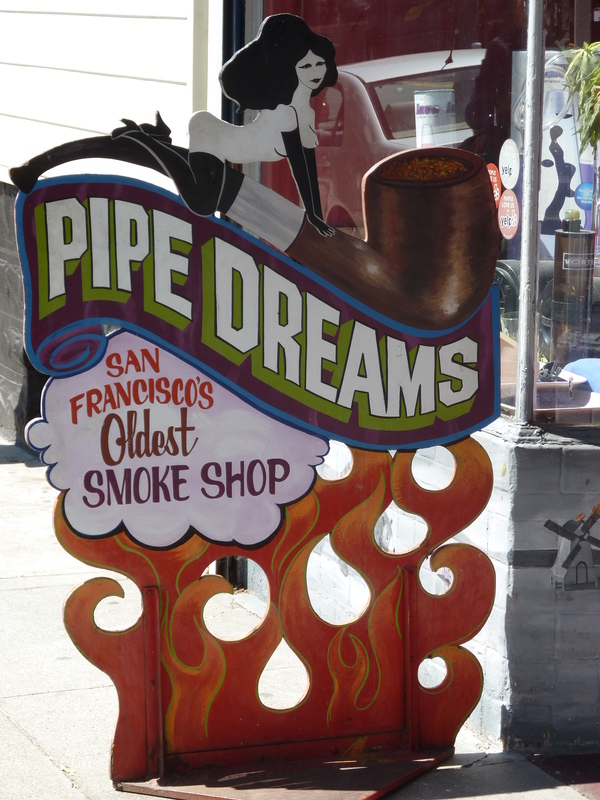 The shops in Haight Street a block away were drowsily coming to life, and a gaggle of skateboarders and assorted “heads” were making their way over to Hippie Hill in Golden Gate Park to hang out for the day. After ten years of inexplicable resistance, we had finally decided to give the Haight-Ashbury Flower Power Walking Tour a try. Having read our e-mail confirmation carefully we were confident that we were at the appointed meeting place. But the time was beginning to concern us. Whilst both our e-mail and the official website had expressly stated that the tour began at 10.30am, we had collected a leaflet the previous day quoting 9.30am. As 10.25, 10.30 and 10.35 passed without anyone joining us, we began to speculate on what might have happened. Was it really a 9.30 start and we were horribly late? Had the tour been cancelled because we were the only participants (and if so why hadn’t we been informed)? Or was the guide merely delayed? I rang the telephone number quoted on the e mail with no success. As frustration turned to irritation at 10.40, a balding, middle-aged man approached us and enquired whether we were on the tour. He had received a telephone call to say that the guide was running late due to a burst water main near her flat. A Kentuckian, he was accompanied by his 20 year old daughter, as well as his son and his girlfriend, both of whom were studying at San Francisco State University. Five minutes later our ears were assailed by a cheery “good morning” emanating from behind us on Waller Street. On turning around we were greeted by a diminutive woman dressed from head to toe in black, apart from the psychedelic leggings flashing intermittently from beneath her huge coat, shuffling towards us. This was Izu, our guide for the next two and a half hours. My heart soared (I may have been alone in this reaction) – here was someone who had palpably lived and breathed the hippie dream in the sixties and, equally importantly, was still doing. This was going to be fun – and I was not to be disappointed. Having made her apologies, referring, not for the only time, to “hippie time”, she squealed with delight at the sight of my Grateful Dead “Steal Your Face” t-shirt. We were instant soul mates and, given my familiarity with the history and music of the era, she regularly sought my input, which, whilst being very gratifying personally, might have annoyed the remainder of the group who weren’t as well informed beforehand. The son’s girlfriend spent most of the morning hiding behind his back and when gently challenged on this by Izu, insisted that she was not feeling well. I’m not convinced she wasn’t just a tad intimidated by Izu’s earnest, energetic approach. Izu’s credentials to conduct this tour were impeccable. She had lived in the Haight for a month during the Summer of Love, and despite returning home to New York immediately thereafter, had been resident in the neighbourhood for many years. One of her most endearing traits was that she had retained her broad New York accent which, incongruous though it might seem, gave an added charm and piquancy to her feast of anecdotes. I particularly delighted in her repeated pronounciation of Haight-Ashberry, proclaimed in a manner that could be heard from several blocks in any direction. 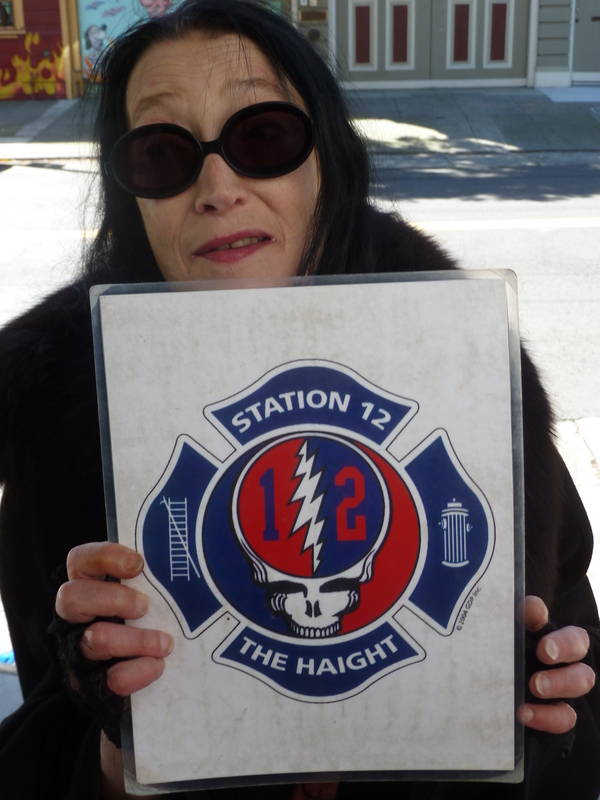 Armed with our free gift of a Haight-Ashbury Flower Power Walking Tour button badge we set off down Waller Street, pausing at the SFFD’s Fire Station 12 which, uniquely, carries the Grateful Dead “Steal Your Face” logo on its engines. 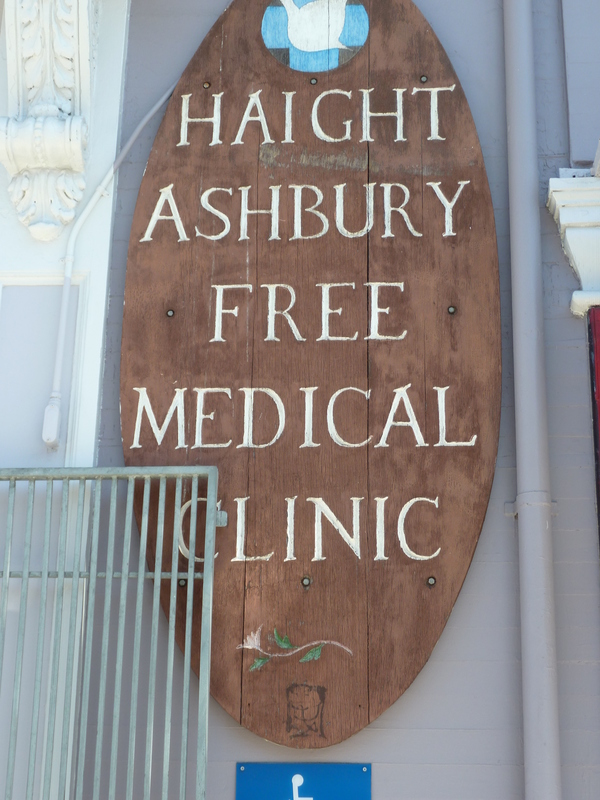 We learned too about the Human Be-In, the influx of young people from all over the United States and the invaluable social service provided by both the Diggers and the Haight-Ashbury Free Medical Clinic. 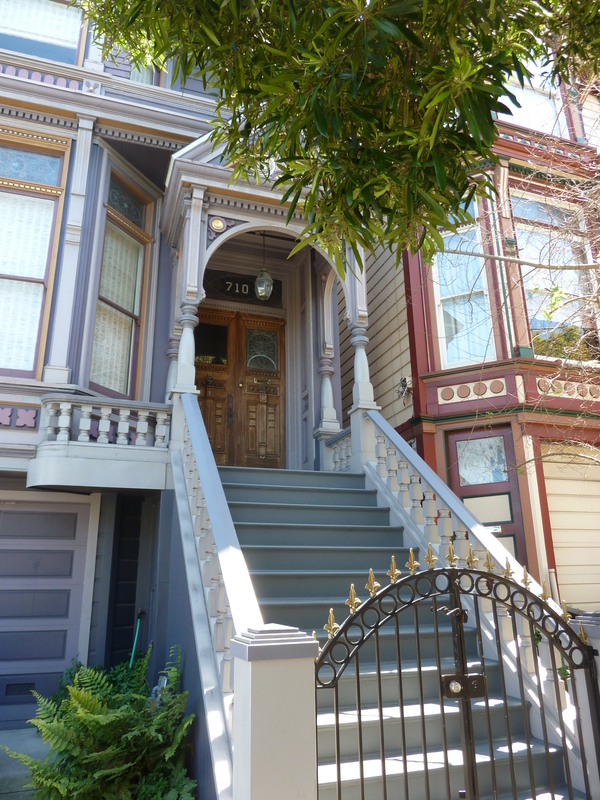 Whilst we stopped at properties that had been lived in by such counterculture luminaries as Janis Joplin (several), Country Joe and the Fish and Jimi Hendrix, as well as Charles Manson, the highlight for me was the Grateful Dead house at 710 Ashbury. Now, I have stood outside this pad many times but, with Izu at my side, I didn’t feel as uncomfortable, as much of a stalker, as I had done before. It helped that Izu knew both the current tenants and their neighbours – well, actually, she appeared to know everybody in the vicinity! We barely passed a shop, café or homeless center without her stopping to hail its occupants. Whilst I went along with every photo opportunity arranged by Izu, I did draw the line at taking one of the Haight-Ashbury sign – been there, done that, not cool. I think we fell out briefly at that point! 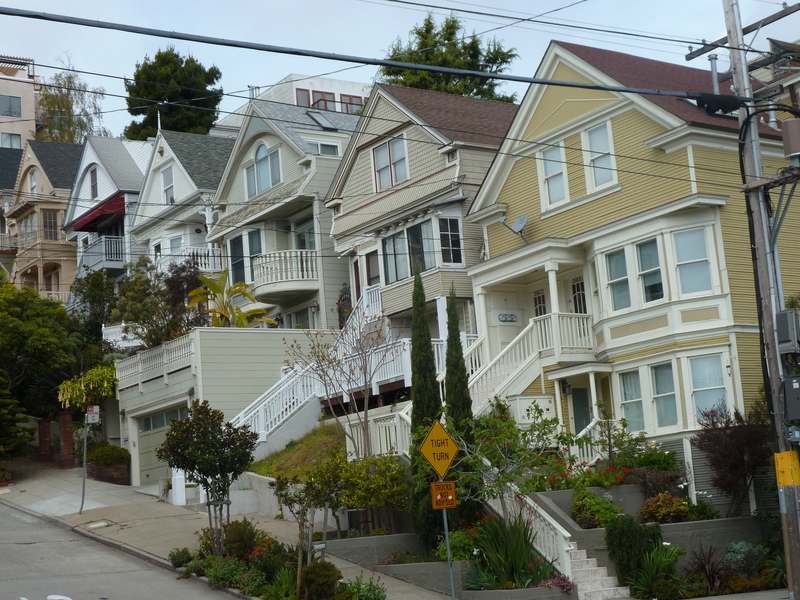 Many San Francisco walks are more like hikes, especially when they involve negotiating its unforbidding hills, but this one is leisurely and laid-back. We barely walked more than 100 yards before Izu asked us to gather round to listen to her stories, not only of the music scene but also the general history of the Haight. She was aided by a canvas shopping bag, from which she intermittently plucked vintage photographs. The tour culminated in a visit to the recently opened Haight Ashbury Museum of Psychedelic Art and History, a center designed to showcase the arts, music and creativity of the era. Depending upon your point of view, it was either impossibly cluttered or incredibly comprehensive. Izu alerted us to historic posters, photographs and newspaper extracts from the hippie Haight. The slogan of the museum is The Hippies Were Right!, a mantra repeated by Izu throughout the tour. As the (larger) badges extolling this theory illustrated, this relates to concern for the environment, emphasis on organic products, peace and love rather than war, sustainable housing and fuel efficiency, and, capping it all, “more fun and less unnecessary work”. I for one find it hard to argue with any of that. The tour ended with heartfelt hugs outside the museum and clichéd, but utterly necessary, poses for the cameras. In summary, this was a relaxing and thoroughly entertaining walk. In fact, the word “walk” doesn’t adequately describe it. It was a “show” in which Izu, in her inimitably animated, slightly wacky style, conveyed a vast amount of information and observation on both what was arguably the neighbourhood’s golden era and how those ideals are being implemented today. Anyone who is deterred by the prospect of becoming preached at on the virtues of free love and rampant drug taking should really not be worried. Whilst Izu, inevitably, relates stories of excessive LSD, marijuana and heroin usage, she takes every opportunity to explain her vehement opposition to drugs. Nor does she gloss over the many unsavoury elements of the period. So go with an open mind and you will be rewarded. But first listen to some live Grateful Dead or Jefferson Airplane whilst you are searching for that old kaftan, transfer a few flowers from your garden to your hair, throw on any piece of jewellery you can find, get on the bus and make your way up to the corner of Waller and Stanyan on a Tuesday or Saturday at 10.30am (yes, that’s 10.30am hippie time). And remember…………….the Hippies Were Right! Finally, after a pre-season match against the Oakland A’s in 2008 and a rain-curtailed “friendly” against the Seattle Mariners two years later, I made it to my first two Major League Baseball (MLB) games at AT & T Park for the opening weekend of 2012. On Saturday evening the San Francisco Giants entertained the Pittsburgh Pirates in the second of a three game series, and then hosted the Philadelphia Phillies in the opening game of three on Monday evening. This is not a match report on either game, though I will briefly outline the action. It is more a series of impressions on the baseball experience. So – the figures. 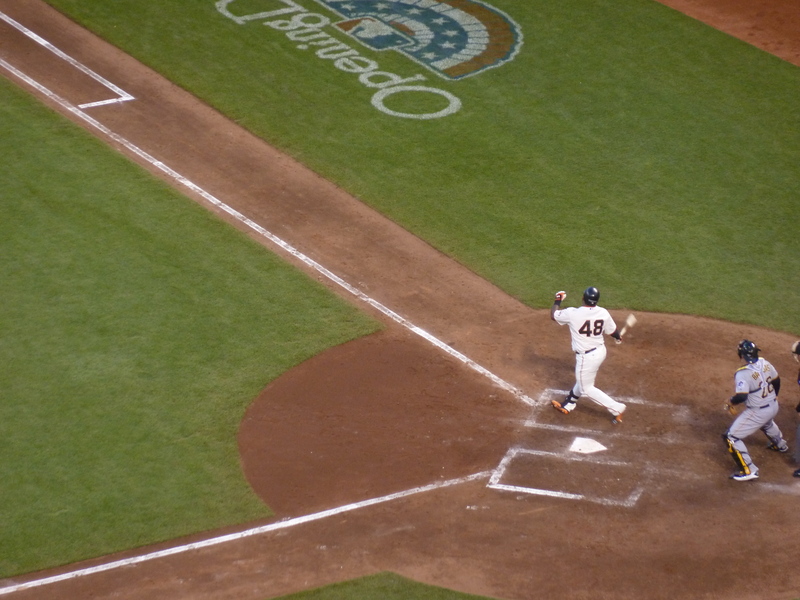 On Saturday, the Giants squeezed out a 4-3 victory in the ninth after trailing both 2-0 and 3-2 earlier in the game. CRedit should go to much-maligned, and many believe, grossly overpaid, starting pitcher, Barry Zito’s second quality performance at the start of the season. A disastrous first innings by star pitcher, Tim Lincecum, in which he gave up four runs, meant the Giants were always chasing the game against the Phillies’ Roy Halladay. Despite Buster Posey’s three hits and improved pitching by Lincecum and the bullpen, the deficit was too much for Giants to pull back, eventually losing 5-2. One win and one defeat, not altogether unexpected, so I’ ll take that. Although we had already printed our tickets at home back in the UK, we wanted to get to the ballpark well in advance of Saturday’s 6.05pm first pitch. 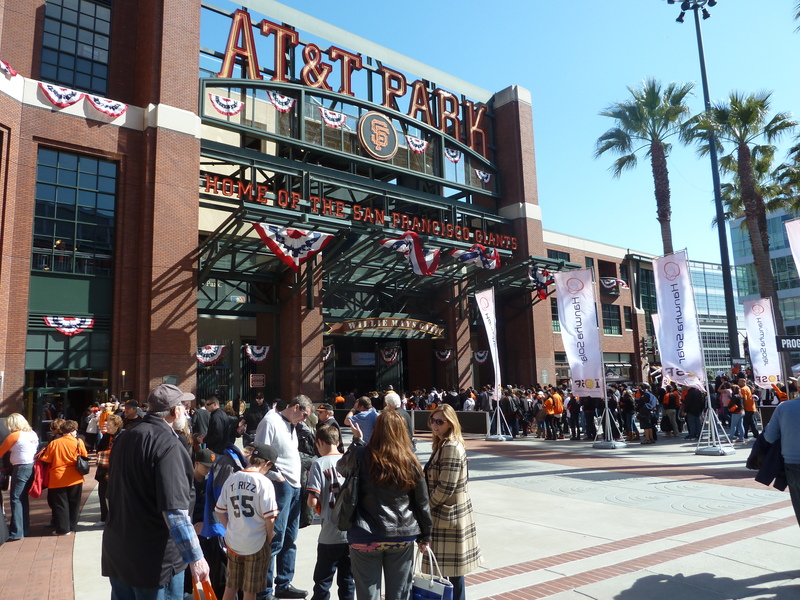 We disembarked from a Muni Metro car at 3rd and King at around 4.30pm, just in time to be welcomed through the turnstiles with a large number of equally excited fans, most wearing the Giants’ orange and black colours. One of many reasons for wanting to get to the park early was that it would guarantee us securing the day’s free gift on entry. Although on Saturday this was a rather modest foam finger, the use for which is modelled in the photograph below, we received a far more elegant A5 size Giants 2012 schedule fridge magnet at the Phillies game. This was the first of a host of fan-oriented activities on both nights. 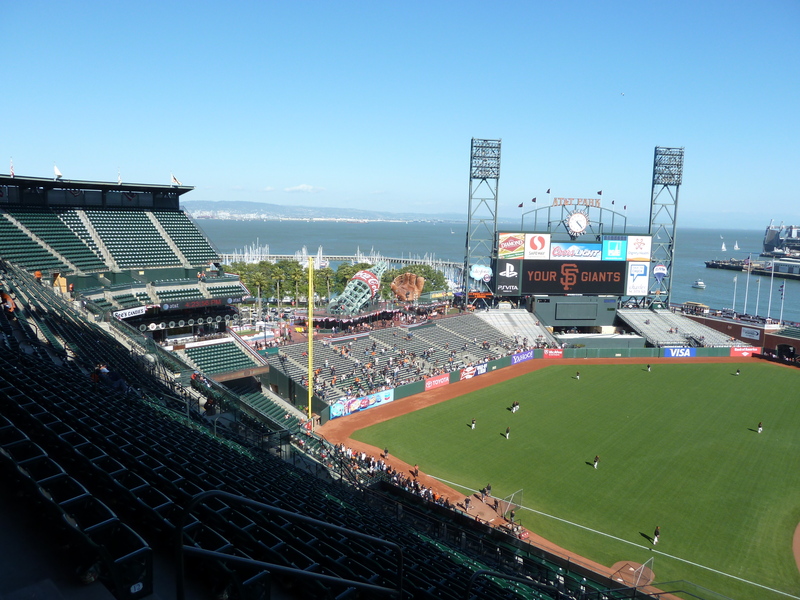 And it is this emphasis on ensuring that the spectators, especially families, have a memorable experience at the ballpark that is so impressive about American sports in general, and the San Francisco Giants organisation in particular, and which I want to concentrate on in this article. Amongst the other gifts scheduled to be handed out at future home games during the season were bobbleheads of the most popular players, including Sergio Romo, Madison Bumgarner and Pablo Sandoval, a Brian Wilson gnome, a Matt Cain t-shirt, fedoras, knitted hats, texting gloves (sic), trading cards and caps. Some of these are limited to the first 20, 25 or 40 thousand fans through the turnstiles, one of many clever marketing ploys to get the spectators eating and drinking early inside the stadium rather than at the bars and restaurants around the “yard”. For children aged 14 and under, they would be greeted at selected games with snap watches, rope necklaces, and Super Hero capes. 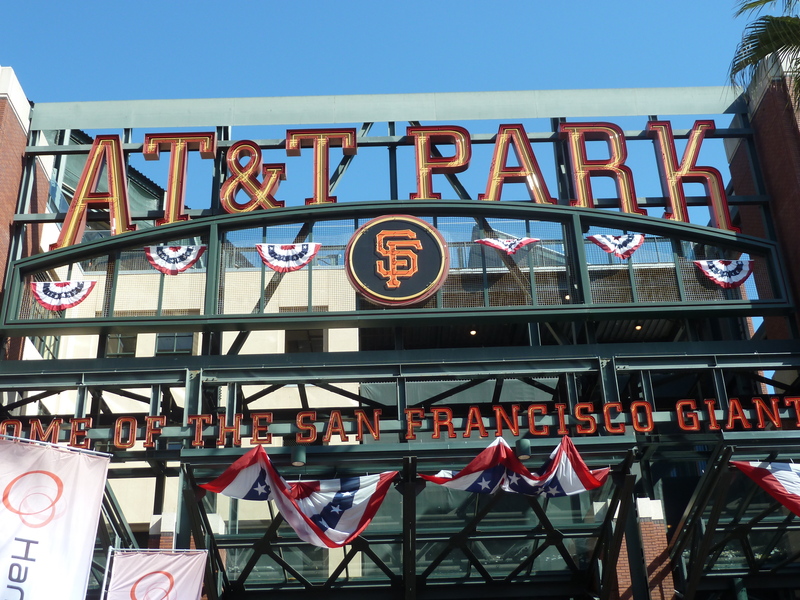 Many of the above gifts were presented by companies such as Subway, See’s Candles, Comcast Sportsnet Bay Area and PG & E.
And then there would be the games that celebrated past glories such as the “Turn Back the Century Game – 1912” and the 2010 Giants World Series Team Reunion. On another day Virgin America would be providing two for one flight vouchers for all fans. San Francisco is renowned for its commitment to diversity, demonstrated in a range of festivals and street fairs throughout the year that showcase its ethnic communities. And the Giants play their part. 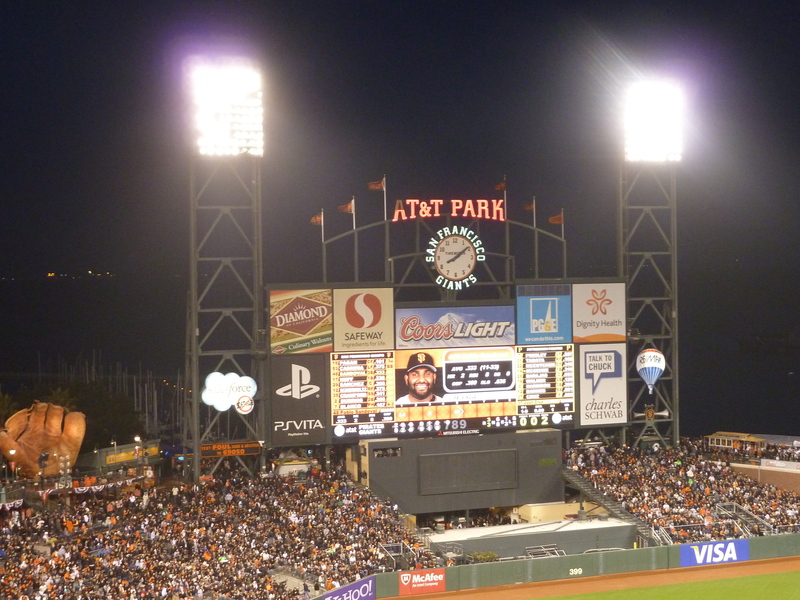 Certain games are designated “heritage nights” where the culture and history of peoples that have played a key role in the history of the Bay Area is celebrated. The list includes Chinese, Japanese, Korean, Mexican (Cinco de Mayo), Irish, Jewish, Italian, Polynesian, African American, Filipinos, and, this being San Francisco, the lesbian, gay, bisexual and transgender (LGBT) community. And then there are the games that are dedicated to firefighters, law enforcement officers, masons and even singles! And, again, it wouldn’t be San Francisco without a series of food festivals, including one where leading chefs from around the area set up stall and offer their wares at a fraction of the price that one would pay in their restaurants. Once inside the stadium, the off-field entertainment, both before, during and, on occasions, after, the game, is excellent. 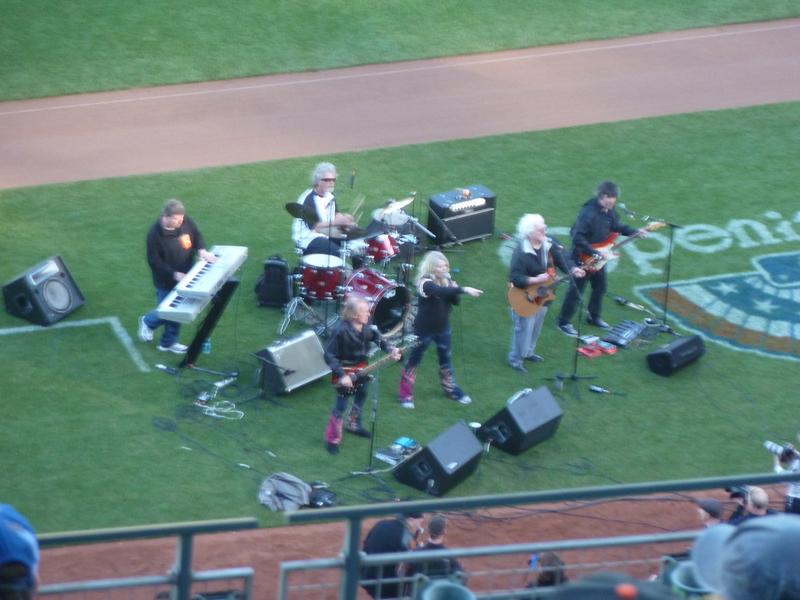 In the lead up to the start of the Pirates game, the crowd was treated to Jefferson Starship ripping through their – or rather Jefferson Airplane’s – catalogue of classic songs, including Somebody to Love and White Rabbit. They returned to lead the traditional pre-match rendition of the American national anthem – not perhaps their finest hour, but I doubt the great majority of the crowd, wrapped in the emotion of the moment, were too concerned about that. Although the breaks between innings in a ballgame are rarely more than a few minutes, the gaps are filled invariably with quizzes, competitions and interviews played out on the large screen / scoreboard, with yet more prizes and special offers available to the lucky fans. 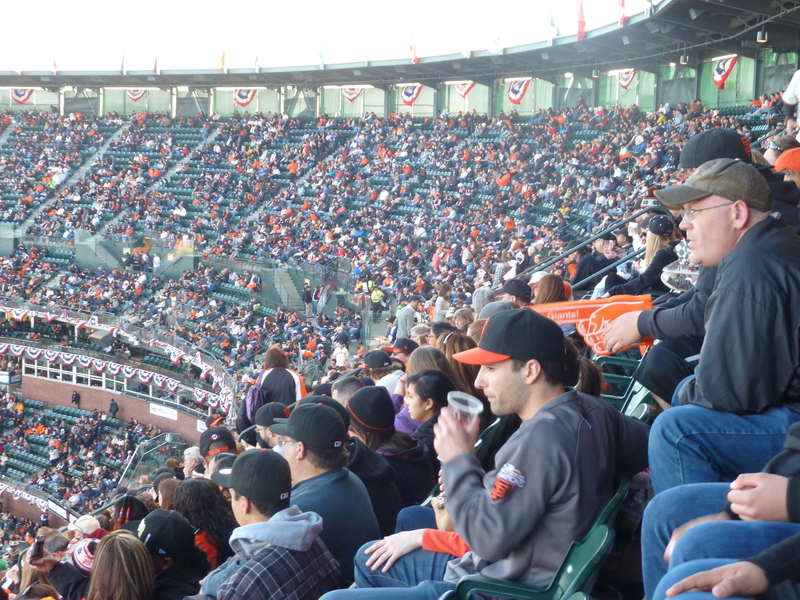 The middle of the seventh community singing of Take Me Out to the Ballpark is another tradition that raises the crowd’s spirits, even if the Giants are faltering. Perhaps the most popular moments are when the camera scans round the crowd to hone in on unsuspecting couples whose duty it is then to kiss each other in front of 41,000 other people. These bring huge cheers, notably when a chaste peck turns into a more passionate clinch. On more than one occasion I wondered whether the “victims” had ever kissed before, might even be on their first date, such was the embarrassed on some faces. But most carry it off with good humour. The antics of Lou Seal, the Giants’ larger than life (particularly around his midriff) mascot, contribute to the party atmosphere. A feisty character, his finest moment is when he strides and struts on the roof of the Giants dugout, leading the ninth innings rallying cry of Dont Stop Believin’ by Journey, which has become the team’s unofficial anthem since the World Series season of 2010. And it had the desired effect in the Pirates game in inspiring the team to pull round a 3-2 deficit to secure a walk-off win in the bottom of the ninth, adding a triumphant note to the spectacular fireworks display at the end. Oh….and there’s always a baseball game going on if you get bored with all the ancillary entertainment! I shall now turn to the other visible demonstration of the fan-friendly approach that epitomises the Giants organisation – the provision of refreshment. 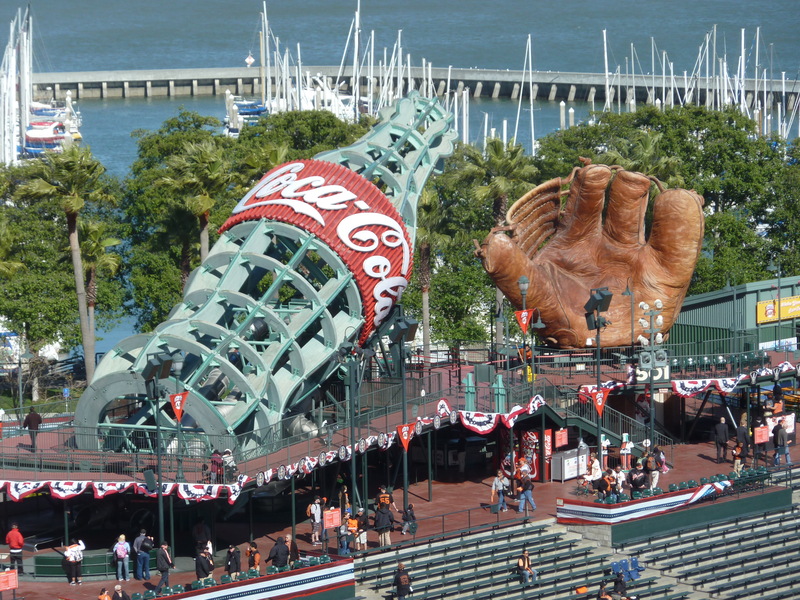 For anyone unfamiliar with American sports, and, as a result, erroneously supposing that the food and beverages at venues barely extend beyond Coca-Cola, Budweiser, hot dogs and hamburgers, would be astonished to see the variety and quality on offer at AT & T Park. Amongst the dozens of outlets at the stadium are California Cookout, Clam Chowder, Crazy Crab’z, Mission Creek Cantina, Cinnamon Roasted Nuts, First Base Carvery, McCovey’s 44 BBQ, Gourmet Sausages, Tres Mexican Kitchen, Long Taters Baked Potato, Doggie Diner, Haagen Dazs, Outta Here Cheesesteaks, Pier 44 Chowder House, Say Hey! Speciality Sausages, Port Walks Pizza, Ghiradelli, Mashi’s Sushi Bistro and Edsel Ford Fong’s. Some of these have multiple stands. But the crowning glory, the signature dish, the product singularly responsible for the unmissable, pungent aroma of the ballpark, apart from on Grateful Dead Day when it is overpowered by the heady waft of dope, are Gilroy’s garlic fries, served up in generously filled trays at many of the aforementioned stands. These are the must eat” option, not only for the human visitors but also for the savvy seagulls that swoop and hover over proceedings in the latter stages of the game. And yes, of course, soda and beer dominate the drinks scene, but this is San Francisco and elegant dining is available too, as witnessed by the Francis Ford Coppola wines my wife and I gravitated towards on both evenings. My only quibble with all this eating and drinking – which clearly provides the Giants organisation with massive income – is that it is so enjoyable that a significant proportion of the sell-out crowds that flock to every game feel the need to keep going back for more – and more – and more – during the actual game, meaning that they miss a not inconsiderable part of the play. If you have the misfortune to sit behind someone who is constantly getting up out of their seat to stock up on yet more food and drink, it can be very annoying. Now, I like a drink and something to eat when I watch football, cricket or baseball, but not at the expense of missing the play. I will get that out of the way before the game, or, occasionally, during a scheduled interval in play, such as half time in football. After all, I am there for the game, no more, no less. But baseball, with its short breaks in play between innings, doesn’t allow one to do that. There is no lunch or tea interval as in cricket, where you may have between 20 and 40 minutes in which to satisfy your hunger or thirst. So I do understand, not only the urge, but also the compulsion to eat constantly during the game, particularly when the fare is so tasty. And if you have children badgering you for a hot dog, coke or ice cream, during the play, it’s hard to resist. But for some people, and not necessarily those with families, the actual game appears almost incidental – or rather that it is no more than a part of the overall experience or the excuse for attending a foodie extravaganza. By the end of Saturday evening when we sat in section 324 View Reserve Infield, overlooking from the clouds (if there had been any) third base, I wondered whether I had been the only spectator in my block who could honestly claim that they had seen every single ball pitched during the game. Even my wife had had to make a call of nature (your fault Mr Coppola – who was at the Phillies game) during the seventh innings! That said, I was one of the first in the extensive queue for the gentlemen’s restrooms at the end! By way of contrast we sat in section 135 Lower Box Infield, immediately to the right of the bleachers on Monday evening and the “problem” was almost non-existent. The higher you sit in the stands the more likely you are to have people leaving their seats obscuring your view. The situation would be worse – if that is the correct word, if it weren’t for the army of incredibly hard working vendors of hot dogs, cotton candy, ice cream and beer that flit amongst the crowd from beginning to end. Their energy, good humour and efficiency are a sight to behold. Lessons to be learned for future visits? 1. If it’s a night game in spring or autumn (or summer for that matter) take a blanket. Although both evenings were clear and relatively still, it became decidedly chilly when the sun went down. 2.Choose seats at a lower level than section 324 – few fans struggled to make it back to their seats without pausing for breath. More chance of catching a ball there too. 3. Take more photos to supplement my report. This article would certainly have benefited from that. We hadn’t intended to ski this year. But between those two statements lay a four month long gallimaufry of resolution, indecision, confusion, excitement, frustration, relief, misery, hope and resignation. 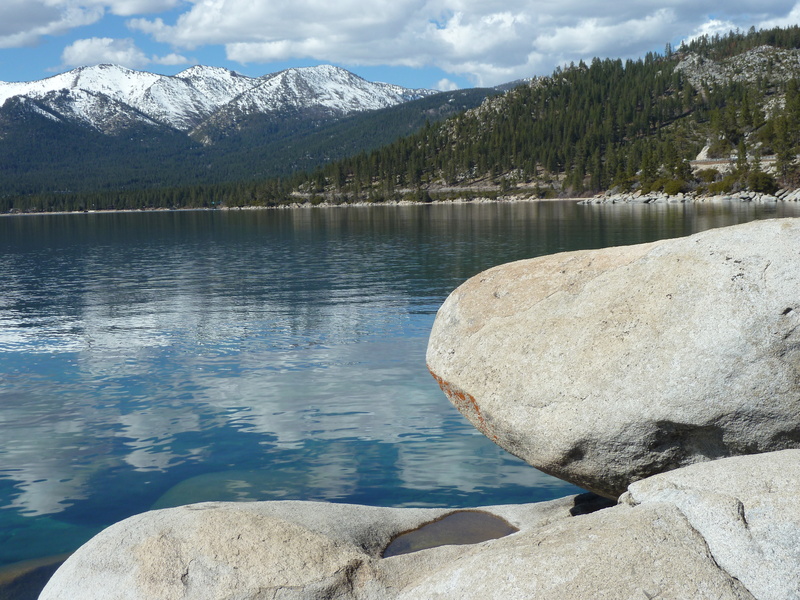 Following last year’s trip, our seventh, to Heavenly ski resort on the southern shore of Lake Tahoe, we decided to give skiing, at least in the USA, a miss this year, and perhaps even next. But as the British summer shrugged its way into autumn, and our equal determination not to visit San Francisco this year, dissipated, the prospect of not skiing at all became increasingly unpalatable. With a major holiday planned for later in the year, we could not afford – in both senses of the word – more than two weeks away. We arranged, therefore, to spend a week in an apartment in San Francisco, drive up to Tahoe for four nights, skiing for three days, before returning to the city for the final weekend prior to flying home. Flights and accommodation were duly booked in the New Year, the lateness of which illustrated how we had prevaricated about going at all. I have written elsewhere that my wife and I are “fair weather” skiers, liking nothing better than cruising perfectly manicured trails in warm spring sunshine. With that in mind, we booked to ski Heavenly between Wednesday 18th and Friday 20th April inclusive, providing us, we hoped, with a felicitous combination of good weather and a healthy accumulation of snow (2011 had been a record year). So we were “sorted”, looking forward to what was fast becoming our annual American skiing fix. Or so we thought, for that’s when it all started to unravel. In deciding to ski late in the season, we’d given no thought to when the resort might be closing. After all, last year it had remained open until early May and only a few days prior to that the previous year. We were not only going to enjoy wonderful weather and spring conditions but would also get some great end of season bargains in the shops. I suppose we should have seen the warning signs earlier in the season as snowfall had been uncommonly sparse, weeks passing with barely a single natural flake bedding down with the undeniably impressive but limited layer of artificial snow provided by the resort’s convoy of groomers. Much of the skiing terrain remained closed. But even at the end of February there appeared to be no cause for concern. Major storms were surely lining up out in the Pacific, ready to deposit the white stuff soon enough. And Heavenly would be prepared to stay open as long as possible to compensate for the relatively poor conditions of December through to March. Wouldn’t it? Firstly, we discovered that Heavenly had planned all along to close on Sunday 15th April – nearly three weeks earlier than last year and, more alarmingly, THREE DAYS BEFORE we were due to arrive! A succession of frantic e-mails, Facebook and Twitter messages over the next 24 hours confirmed this to be the case. At least we had not incurred great expense at this stage – just the first night’s accommodation, which could be cancelled up to 72 hours before arrival anyway. Unusually (we must have known), we had not booked our lift tickets and we would not obviously have hired equipment until we were in the resort. But what were we going to do? I devised eight alternative options for the middle leg of the vacation. These included remaining in San Francisco, driving down the coast and spending nights in San Luis Obispo, Carmel and Monterey, or in the opposite direction via Mendocino and Bodega Bay, even still travelling to South Lake Tahoe but amusing ourselves in other ways. But the thought of not skiing at all, when the conditions were likely to be the best they had been all season, was too painful to contemplate. And, of course, you guessed it – by this time, those slothful storm systems had swung into town with a vengeance, depositing seven feet of snow in a week! Having decided that we had, if we could, to ski somewhere, we found ourselves forced into doing what we had often spoken about but never got around to doing before – slide down some other slopes than Heavenly’s. So perhaps it was all a blessing after all – provided we could find other resorts that were open whilst we were in the area. 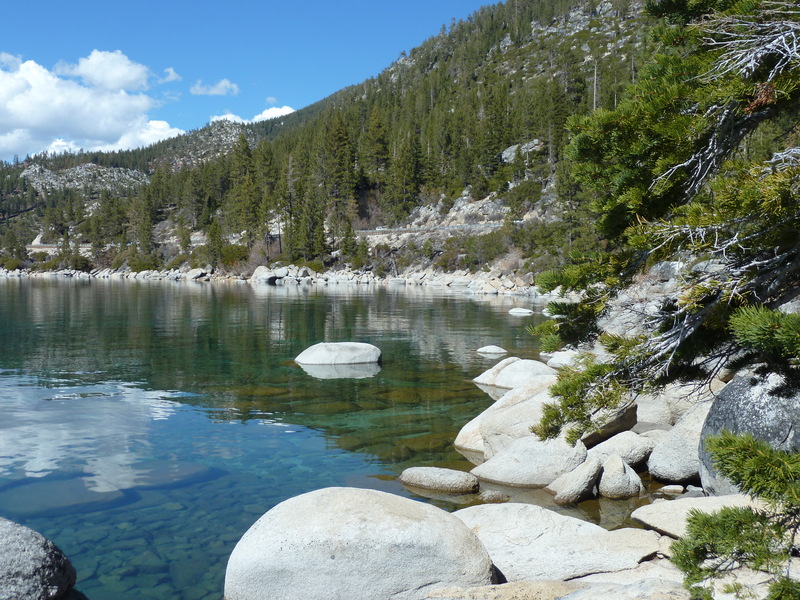 The next few weeks were spent anxiously trawling the websites of, and sending e mails to, Sierra-at-Tahoe, Kirkwood, Homewood, Alpine Meadows, Sugarbowl and Squaw Valley to establish what their closure plans were. Whilst, in one respect, we were now becoming increasingly excited at the prospect of skiing elsewhere, this threw up several practical issues. For example, if we were to ski near the north end of the lake, we would need to find alternative accommodation, and it was extremely limited in some resorts, particularly at such a late stage. We would also need to take a different route to the one we were accustomed to to get to the lake. The fact that we would be skiing only a day, possibly two, at a new resort would also mean we would be unfamiliar with everything there – the terrain, transport, equipment hire and so on – to the extent hat we might not derive much enjoyment from it. But beggars can’t be choosers, and, after all, it meant we could ski. And then……Heavenly decided to extend its season! We could now avoid all the complications of staying and skiing elsewhere and return to our familiar, much loved Plan A of skiing in Heavenly for three days. Rather than extending by a full perhaps two, to allow its customers to enjoy the fresh snow, the resort proposed to close as planned on 15th April and reopen for the next two weekends only (Friday to Sunday inclusive). The upshot of this would be that we would have ONE day in which to ski! Again we considered different scenarios, including skiing only on the Friday, our last day. Better than nothing. 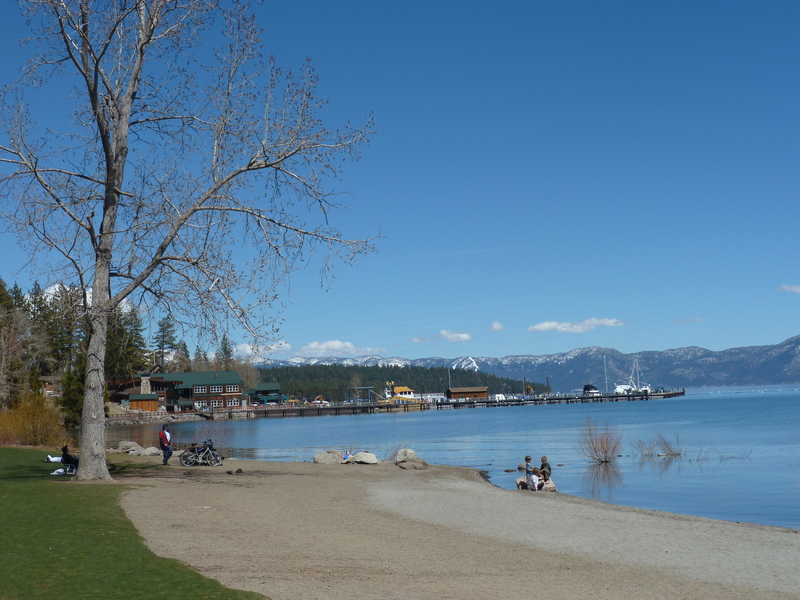 But we rather liked the idea now of skiing somewhere else too, and plumped for a day at nearby Sierra-at-Tahoe. Now, neither of us had been fully fit in our last couple of days in San Francisco, suffering from sore throats, coughing, headaches and general tiredness. So we decided that two days skiing would be sufficient. The final plan now went like this. 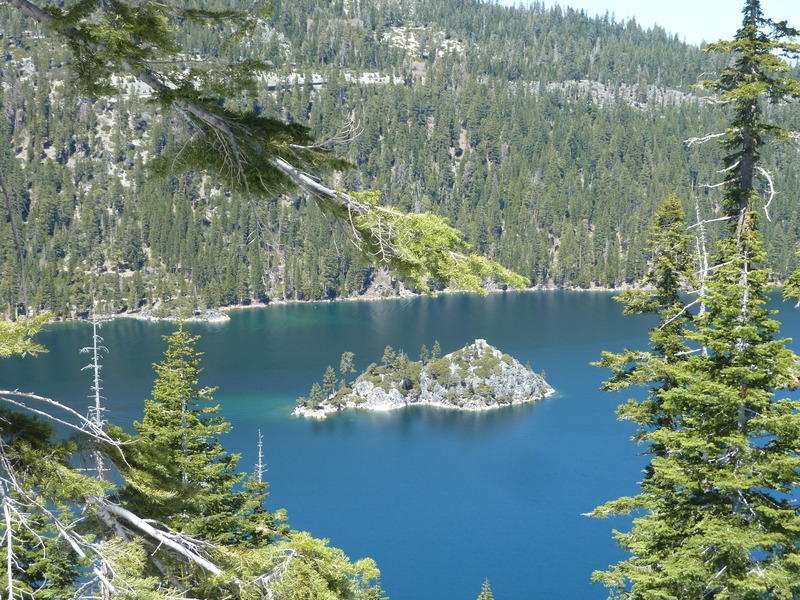 As it was conveniently located just off the I-50, we would call into Sierra-at-Tahoe on our drive from San Francisco on Tuesday and familiarise ourselves with the resort. We would then take our first full day off and perhaps drive to Carson City, before skiing at Sierra on Thursday and Heavenly on Friday. What could now go wrong? After the twists and turns, and mangled emotions, of the past three months, we were going to be skiing for two days, one of which was going to be at, for us, a new, exciting resort, and the forecast was for brilliant blue skies and warm temperatures. Well, one three letter word ending in a vowel was about to be replaced by another and destroy those plans. On the journey to South Lake Tahoe, we both started to deteriorate dramatically, to the extent not only that we abandoned the diversion via Sierra-at-Tahoe, but that we were only able to leave our room – reluctantly – in the next 48 hours to stock up on pharmaceutical supplies (and the occasional Starbuck’s). Dinner on our first evening consisted of a $1 packet of Dorito’s from the vending machine along the corridor. It was only the last – fourth – night that we were both able to do any justice to an evening meal when we dragged ourselves to the Hard Rock Café in our hotel. Even then, we had had to cancel our reservation beforehand at the Riva Grill. We did manage, however, to drive around the lake during the day, as the last post testifies. We had both been so debilitated during our stay that walking alone proved a challenge. As much as we wanted to, we could not have skiied. At least we saved on meals, ski hire and lift tickets – although the colourful cocktail of pills, infusions and liquids – enough to have taken the weight of our baggage over the allowance had we been flying back to San Francisco – were not cheap! 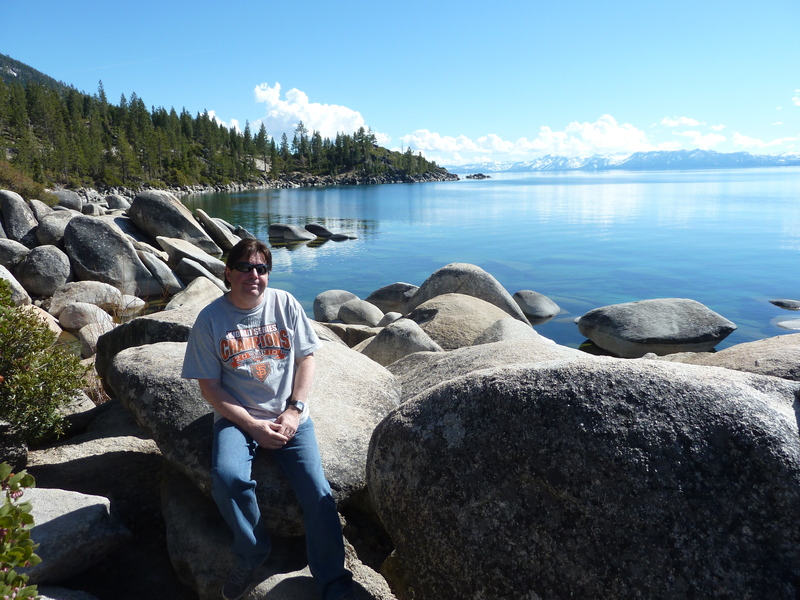 With the skiing leg of our recent trip to California decimated by illness (the subject of an upcoming post), we took the opportunity of the glorious spring weather on our last day in South Lake Tahoe to finally realise a decade long ambition of driving round the entirety the lake. Below are some of the photos we took, which I hope provide some illustration as to why Mark Twain claimed that “it must surely be the fairest picture the whole world affords”. What No Golden Gate Bridge or Cable Car? Only after we returned from our latest trip to San Francisco did it occur to me that, during the ten night stay, we had neither visited such perennial favourites as the Golden Gate Bridge, the Palace of Fine Arts or Alamo Square, nor taken a single ride on a cable car. How can you travel nearly 6,000 miles to one of the most popular cities on earth and not take in its most iconic locations I hear you say? Surely, you are missing out on the greatest experiences it has to offer? That is not, however, the way I see it. Rather than accept that this represents poor planning and an opportunity missed, I rather view it as a sign of our growing maturity as visitors to San Francisco. The fact is that we no longer feel the need to tick off as many of the guidebook recommendations as possible, tiring us out unnecessarily in the process. The nature of our time spent there is increasingly taking on a different, more relaxed, you might even call it ordinary, tenor, one that more closely mirrors that of how we live at home. Being in San Francisco has become such a familiar and regular part of our lives, somewhere we visit more often even than the places we love in our own country, that it has assumed that status of our second home, and, therefore, somewhere we neither have to pretend to be what we are not, nor have to do what we feel we ought to do. Choosing to stay some distance from the tourist enclaves of Union Square or Fisherman’s Wharf, as we did in Noe Valley this year, allows us to do as much, or as little, as we feel on any given day. If all we want to do is to hang out at the apartment in the morning, watching the Bay Area news on TV whilst catching up on household chores, before strolling out to a neighbourhood café for lunch, followed by gift and food shopping and then returning to the apartment for a glass or two of wine on the outside private deck whilst watching the world go by, then so be it. We then might eat in in the evening – or we might try out one of the local restaurants. 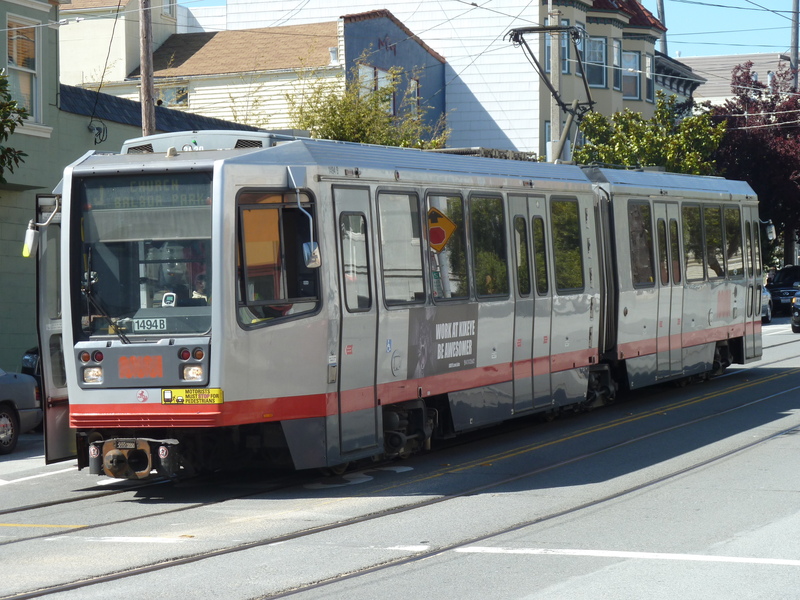 Or we might decide to take the metro downtown and eat in Chinatown or North Beach. The point is that we are at liberty to do as we wish, not as we feel we ought to do to make the most of the trip and the not inconsiderable expense. Of course, it has been the happy conversion from hotel to apartment living over the past three years that has enabled us to do this. And if it sounds to you that living in San Francisco has become less exciting for us, even routine, even a chore, then you could not be further from the truth. Whilst I can comfortably claim that we now feel at home in the city and, for myself in particular, probably did so before I ever visited it, I am tempted to suggest even that we have become, in a small way, San Franciscans, interested in its politics (with a small “p”), culture and, undeniably, its sport – just as we do at home. And remember – those wonderful attractions are still a short drive or a bus or taxi ride away. Nor is it the case that we no longer go sightseeing – far from it. On our recent trip we may have bypassed some of the more renowned locations, but we made a conscious effort to sample new, and nearly new, experiences, some of which were long overdue. 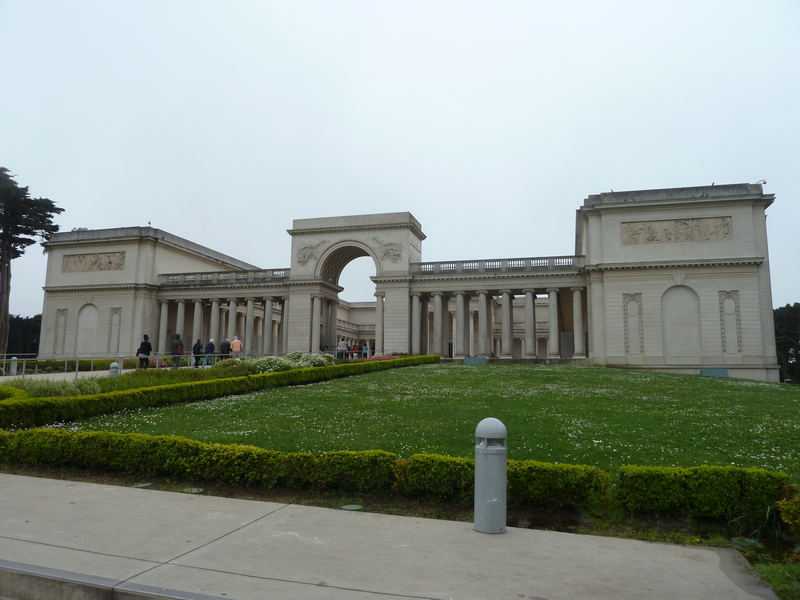 These included a tour of City Hall, exploring Nob Hill, the Castro and Hyde Street Pier in depth, reliving the Summer of Love on the Flower Power Walking Tour, sunbathing in Dolores Park, and spending an afternoon in the excellent California Palace of the Legion of Honour. 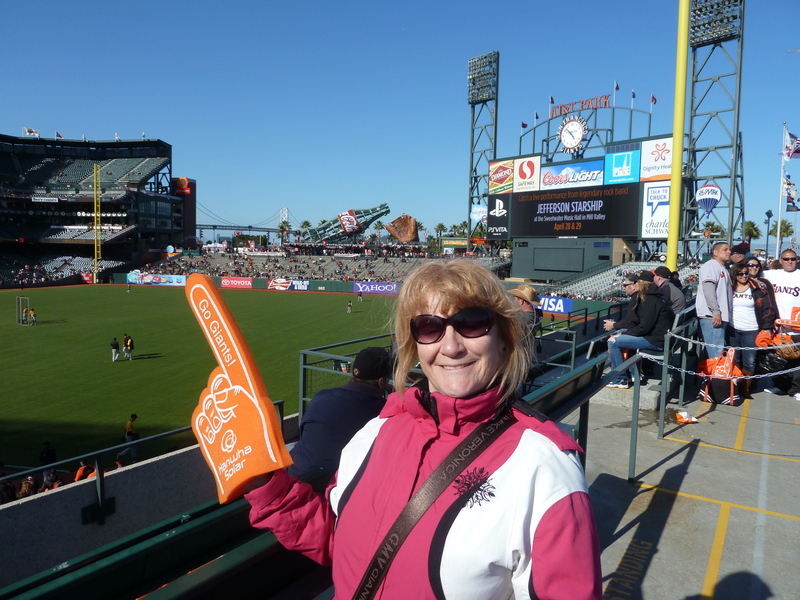 Attending two Giants games at AT & T Park and a thrilling Elvis Costello concert at the Warfield, as well as eating out at more traditional restaurants such as John’s Grill (in the Maltese Falcon room) and the Daily Grill (Lefty O’Doul’s was too busy) added real richness to our stay. And we still found time to take in several of our favourite spots – Golden Gate Park, including the Japanese Tea Garden and Stow Lake, Sunday brunch at the Cliff House, dinner at the North Beach Restaurant, Beach Blanket Babylon, Haight-Ashbury, the Ferry Building and the depressingly under threat Gold Dust Lounge. And, of course, a spot of DSW shoe shopping for my wife in Union Square – now, heretically, resident in the former Border’s bookstore (the shoe shop, that is, not my wife – though she might like to be). Having read the above, perhaps the vacation wasn’t quite as relaxing as I first thought!